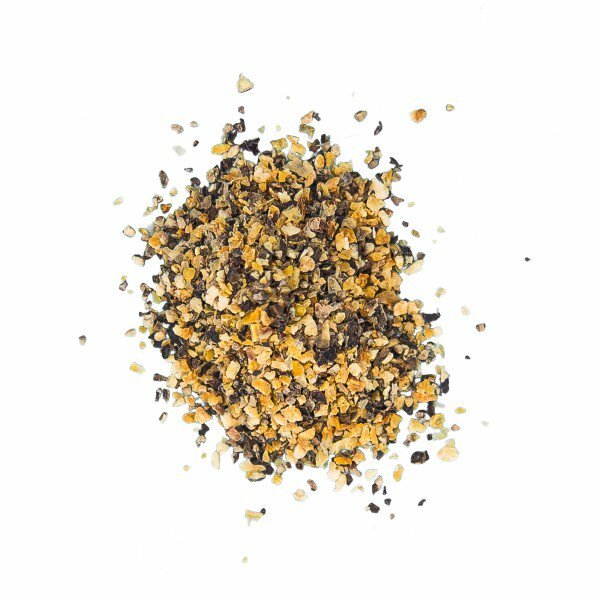 Our zingy lemon pepper is made from cracked black pepper and granulated lemon zest to give you a warm, citrusy tang. The flavours of these two popular ingredients merge beautifully making the blend ideal for using as either seasoning or a condiment. If you like fish and poultry dishes, this blend should be an essential ingredient in your store cupboard. Did you know that like lemon, pepper contains vitamin C? A 100g serving of lemon can provide as much as 50mg of Vitamin C and 100g of black pepper contains up to 21mg of Vitamin C, making our tasty blend an extra way to add a little extra vitamin C to your daily diet. Allergy Advice: This product contains black pepper which contains a naturally occurring source of salicylates and is best avoided by people eating a salicylate free diet. Lemon pepper can be used as a condiment to season meals in place of salt. This zesty blend of lemon and pepper will add maximum flavour to your meals. It makes a delicious meat rub or marinade. Use it to pep-up chicken fillets, drizzle with lemon juice and a shake of tarragon prior to grilling. Or use in the same way with added dill for cooking fish fillets. Add to breadcrumb coatings, stir into couscous and grains, sprinkle on cooked vegetables, pasta and salads. This flavour combination works well with most meats but goes particularly well with fish and poultry.